A Highway Patrolman waited outside a popular local bar, hoping for a bust. At closing time, as everyone come out he spotted his potential quarry. The man was so obviously inebriated that he could barely walk. He stumbled around the parking lot for a few minutes, looking for his car. After trying his keys on five other cars, he finally found his own vehicle. He sat in the car a good ten minutes, as the other patrons left. He turned his light on, then off, wipers on, then off. He started to pull forward into the grass, and then stopped. Finally, when he was the last car, he pulled out onto the road and started to drive away. The patrolman, waiting for this, turned on his lights and pulled the man over. He administered the breathalyser test, and to his great surprise, the man blew a 0.00. “This equipment must be broken!” exclaimed the patrolman. Watchdog is an English slang which means a person or an organization responsible for making certain that companies maintain particular standards and do not act illegally. We have different kinds of watchdogs in our society. We have human rights watchdog, consumer watchdog, neighbourhood watchdog, family watchdog, government watchdog, Churches watchdog, public school watchdog, Catholic school watchdog, ID watchdog etc. These people are monitoring the activitives of different organizations and institutions to hold them accountable, making sure that they are doing the right things and be productive. They are public defenders. Their mission would become destructive when they turn into destroying, paralyzing and blocking others to growth. During Jesus’ ministry, the Scribes and the Pharisees were acting as watchdogs. They were defenders of the laws; so they watched Jesus’ activities carefully. It was difficult to tell whether they genuinely loved the laws or they simply wanted to discredit Jesus and destroy his mission. It might be a mixture of both. Throughout the Gospels, there were multiple incidents of conflict between these watchdogs and Jesus. In today’s Gospel reading, they brought in a woman caught in committing the act of adultery. She was guilty. According to the law, she should be stoned to death. If Jesus said she should be stoned according to the prescription of the law, he would set himself up above the Roman authority, because only the Roman authority had the right to sentence someone to death. He also would act against his own teachings of mercy, compassion and forgiveness. And if he forgave the woman, he would be accused of disregarding the Moses’ laws. Jesus was not succumbed to their tactic. He refused to play their game. He used his finger to write down something on the ground. They continued to press him for an answer. 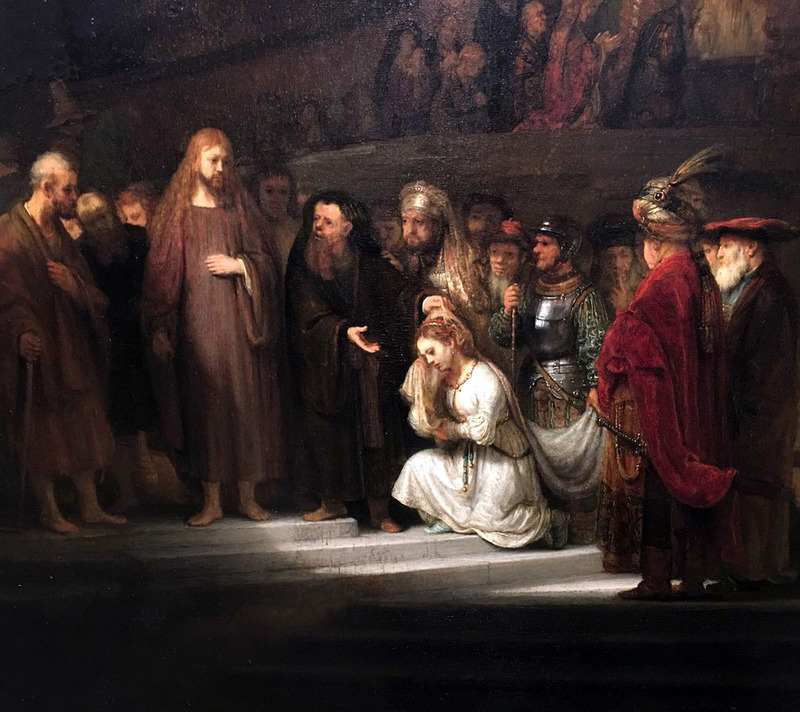 So Jesus looked straight at their faces and said, “Let the one among you who is without sin be the first to throw a stone at her.” Then he bent down to continue his writing on the ground. We do not know what he was writing, but these accusers began to withdraw one by one. Some said, the first time he might be writing down the names of the accusers; the second time he was about to write next to their names the sins they had committed. That was why they were afraid of; so they withdrew. Jesus knew their hearts. Jesus knew our hearts. They knew, and every one of us also knows that we have sinned. We do fail God and one another sometimes. We do break the laws once in a while. Sometime it is a minor violation; other times it might be a major violation. Minor of major, when we get caught in violating the law, every one of us wish we would be treated with understanding and forgiveness. Have you ever been stopped by police for traffic violation ? I have. When it happened, we wish that the officers would give us a warning rather than a speeding ticket. Would you wish your teacher to give you a second chance if you fail your exam? This was a great lesson for the Scribes and the Pharisees as well as for all of us. We must learn to treat one another with love, mercy and compassion. We are one human family. The golden rule that Jesus sets up for us is “Do to others what you would have them do to you” (Mt 7:12). We are here not to condemn but to help one another to be better. God is ready and willing to give us multiple ‘second chance’ to correct ourselves. The laws are there to protect us from harming ourselves and others. Jesus was unwilling to condemn this woman to death merely to satisfy a legal requirement. He came to renew the laws. He came to show us that God values human life. Judgmentalism was a disease in the Jewish society in Jesus’ day. It is also a disease to divide us and to keep us from bonding with one another. Jesus’ action showed them that people were more important than law codes. Having rescued the guilty woman and forgiving her sin, Jesus did not discard the law; He asked her to “go and from now on do not sin any more.” Her life is more important than the law. Jesus believed in redemption. He believed that human weaknesses were redeemable. He showed mercy.